Billed as the ‘slimmest and fastest Nexus phone ever made,’ the eagerly awaited LG-made Google Nexus 5 has finally been officially announced – and it you’ll be able to buy it tomorrow. Priced as competitively as its predecessor, the latest and greatest Nexus packs a 5-incher screen supporting a 1080p display, while inside a 2.3GHz quad-core Qualcomm Snapdragon 800 CPU should keep things motoring along. There’s 2GB of RAM with storage coming in 16 and 32GB configurations (but no MicroSD card slot, sadly). The main camera is an 8MP job that notably comes with OIS (optical image stabilisation) camera to keep away camera blur, plus a new HDR+ mode which automatically snaps a rapid burst of photos and combines them to give you the best possible shot. Powered by the new Android 4.4 KitKat OS and available in black or white finishes, the Nexus 5 has a 2300mAh battery and wireless charging capabilities. A North American version with CDMA support, 7-band WCDMA and 9-band LTE, and an international version with 6-band WCDMA and 6-band LTE will be offered. The Nexus 65 is priced way below rivals like the Samsung galaxy 4 and the iphone 5s, with the 16GB version costing £295/$349 for 16GB and the larger 32GB model selling for £339/$399 SIM-free. Just in time for Halloween, we have two new treats for Android fans. First, we’re excited to unwrap our latest platform release, KitKat, which delivers a smarter, more immersive Android experience to even more people. 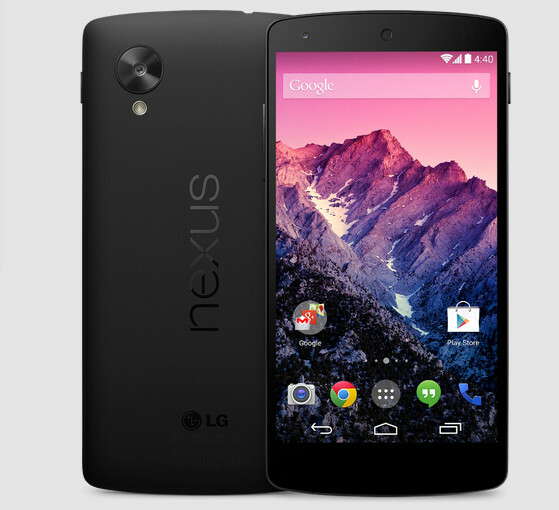 And second, we’re introducing Nexus 5-a new Nexus phone developed with LG. The first thing you’ll notice about KitKat is we’ve made the experience much more engaging: the book you’re reading, the game you’re playing, or the movie you’re watching-now all of these take center stage with the new immersive mode, which automatically hides everything except what you really want to see. Behind the polish on the screen is the power under the hood. Take the Phone app, which for most people hasn’t really changed since the days of flip phones. Now, we’re making calling easier than ever, by helping you search across your contacts, nearby places, or even Google Apps accounts (like your company’s directory), directly from within the app. And with the new Hangouts app, all of your SMS and MMS messages are together in the same place, alongside your other conversations and video calls, so you’ll never miss a message no matter how your friends send it. This is just a small taste of KitKat-learn more on our site. Google has always focused on helping users get immediate access to the information they need, and we want to bring this same convenience and power to users on Android. With the new Nexus 5 launcher, Google smarts are deeply integrated into the phone you carry around with you, so getting to the information you need is simple, easy and fast. Swipe once from the home screen to get Google Now literally at your fingertips. Put Google to work for you by saying “OK, Google” to launch voice search, send a text, get directions or even play a song you want to hear. And in the coming weeks, we’re enhancing Now with important new card types that bring you information about contextual topics that interest you such as updates from a favorite website or blog. Building a platform that makes mobile phones accessible for everyone has always been at the heart of Android. Until now, some lower-end Android phones couldn’t benefit from more recent Android releases due to memory constraints. With KitKat, we’ve slimmed down Android’s memory footprint by doing things like removing unnecessary background services and reducing the memory consumption of features that you use all the time. We did this not only within Android but across Google services like Chrome and YouTube. RAM (or memory) is one of the most expensive parts of a phone, and now Android can run comfortably on the 512MB of RAM devices that are popular in much of the world, bringing the latest goodies in Android 4.4 within reach for the next billion smartphone users. Along with our sweet naming tradition, we also introduce a new device with each platform release to showcase the latest Android innovations. 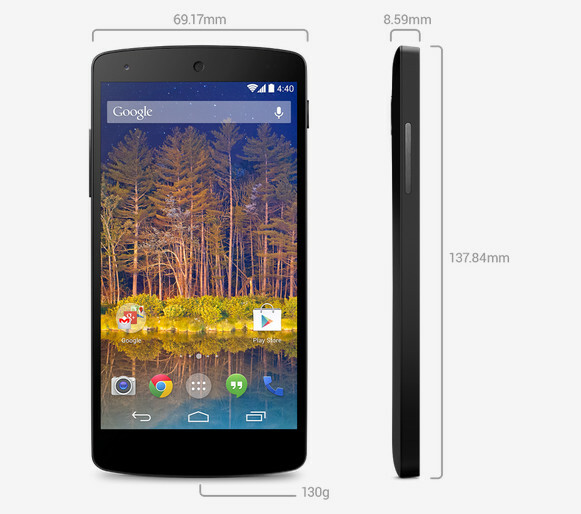 For KitKat, we partnered with LG to develop Nexus 5 — the slimmest and fastest Nexus phone ever made. Its design is simple and refined to showcase the 5″ Full HD display. Nexus 5 also keeps you connected at blazing speeds with 4G/LTE and ultra fast wifi. The advanced new lens on Nexus 5 captures more light for brighter night and sharper action shots. And with optical image stabilization, you no longer have to worry about shaky hands and blurry pictures. A new HDR+ mode automatically snaps a rapid burst of photos and combines them to give you the best possible single shot. Learn more on our site. Nexus 5 is available today, unlocked and without a contract, on Google Play in the U.S., Canada, U.K., Australia, France, Germany, Spain, Italy, Japan and Korea (and coming soon to India), starting at $349. 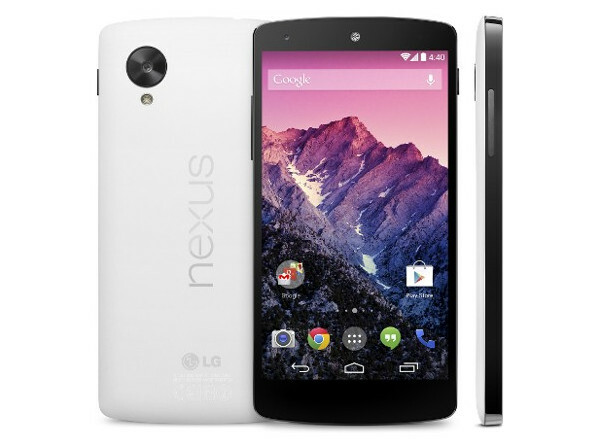 Just in the time for the holidays, Nexus 5 will be available soon at the following retailers: Sprint, T-Mobile, Amazon, Best Buy and RadioShack. How’s that for a treat?